A first person account of my first Art Basel experience and exhibition around the corner at the Catalina Hotel, where the Select Art fair was held. Other than taking the red eye, my only other major regret was missing my friend Brandon Alvendia performs at the New Art Dealers Alliance (NADA) fair further toward North Beach. 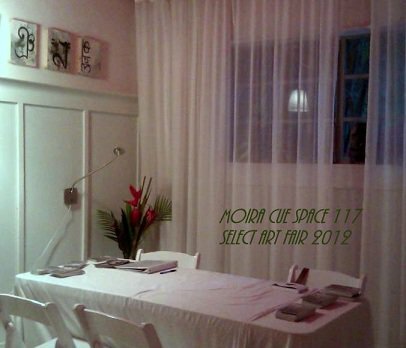 I heard great things about NADA, one of which was that the artists had worked together collectively to release their own daily newspaper to keep artists within the show connected to each other and aware of everything going on during Art Basel. December 5th: When I arrived at the Catalina, Michael Benisty’s giant silver skull (taller than a basketball player) was already on display in the parking lot, visible from the street, and attracting quite a bit of attention. Inside the hotel’s lobby hung a highly colorful, large scale abstract collage of panels created by well-known Philadelphia artist James Dupree. I assumed this piece belonged to the hotel’s permanent collection. I couldn’t imagine anything else (especially white walls) in its place. Later I discovered it had been hung just prior to Art Basel’s kick-off, and the artist was gracious enough to extend the work’s stay at the Catalina a little while longer. Although I have been showing my work for decades, this was the first time I had to hang a show entirely on my own. The only thing that saved me was the cookies I’d baked and carried through TSA security for that night’s VIP premiere. After indulging, a few good bellmen decided to break the rules about helping artists, and loaned me a ladder, brought a night table that could double as a pedestal, and lifted my brother’s 150 lb. marble sculpture, “Ghost Pepper,” out of its custom built crate. After hanging my panels, showering and changing, I was finally ready to open. I spent Thursday showing our work, being proud of my brother “Marty,” (sculptor Martin Cue) whenever visitors entered the room and their eyes widened, and they’d gasp an audible breath of amazement. “Can I touch it?” was usually the first question, one I answered affirmatively before launching into my pitch. The price we were asking was a steal, but not within everyone’s reach. Still, it got people talking and I developed a whole new appreciation for my sibling’s talent. The nicest thing anyone said about Marty’s work (besides the interest of a highly respected, established West coast art dealer) was from the delightful Barry Burak, of Affiliated Healthcare Centers, Inc. Barry said that the Ghost Pepper was “very much in the spirit of Dali.” Coming from Barry, who owns 200 Dali originals (including a rare Dali necklace, of which there are only thirty in the world, which he wore around his neck) that’s a huge compliment. These images of selected 8″ by 11″ black and white paintings are inspired by the shared formal affinity of typesetter and painter; both must solve the problem of the picture plane, dividing it with intersecting horizontal and vertical lines. (This dynamic grid is the unseen foundation of our semiotic heritage.) The use of images of fonts that are not characters in the western Latin-derived alphabet transforms symbols of unknown sounds into symbols of a subjective individual reality, raising the question: Is it truly possible to codify human experience in a world divided by language and other geopolitical and cultural boundaries? I didn’t get a chance to visit the other exhibitors at SELECT until Friday afternoon. There was, it goes without saying, more art than I can possibly describe. A blue toned snorkeling bunny rabbit by Eckhard Besuden snorkel bunny blue EU art was one of my favorite works at EUART. Evan Boggess’s hard geocolored paintings reflected not just knowledge, but a sophisticated understanding (for someone so young) of all the academic issues in painting today. Mariusz Navratil’s cool graphic abstractions contrasted with the wild flair of the prolific Jeff Flipski, a Florida artist whose walls overflowed with funky cartoon like monsters but both artists shared an “all-over” or Pollock-esque approach to the canvas. While I was browsing the other booths, two women arrived with an almost military determination to complete a purchase of Christopher Maslow’s paintings, which I would describe as Dali meets Vogue cover model circa 1983. Derek Gores’ torn paper collages definitely fit the pop art category, and Daniel Perales’ photography studio almost glowed with a halo courtesy of John Singer Sargeant. Melissa Maddonni Haims covered the lobby railings in fiber works, giving a literal “warm fuzzy” ambiance to the event. I also enjoyed being introduced to the work of Senegalese-born sculptor Ousmane Gueye, who, remarkably, is said to have been encouraged by Pablo Picasso himself as a child. I applaud the SELECT fair administrators (Brain Whiteley, Marc Johnson, Brady Dreasher, and last but not least, Matthew Eck, aka “the ebullient Mr. Eck”) for accepting a representative quantity of work by females and people of color. The Jessica Osceola Collective exhibited the work of Native Americans, notably another young artist to watch, Cannupa Hanska, whose work serves to create a dialogue about cultural stereotypes of indigenous people. Friday, my next trip outside the Catalina was down the street to Aqua, another hotel fair where furniture was removed from rooms to make way for art. I’d been invited by painter Barbosa Prince, while en route to the Art Basel School of the Art Institute Alumni reception at The James Thursday night. (I met Prince along with Dickson Schneider, who was giving away free art.) 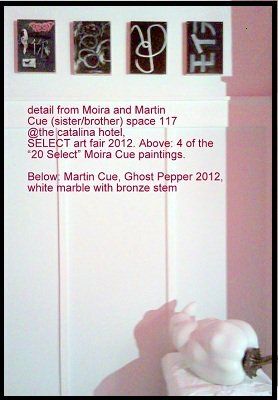 Regarding the paintings of Mr. Prince: while the subject matter (the Mexican drug war) was gruesome, they were clearly painted by someone who not only observes, but cares about the human condition. Call me old-fashioned. I believe that art must take up, or at least not mock or ignore, the plight of the masses. Sunday I set aside my drive to close sales and finally stepped foot inside Art Basel at the Convention Center. This show is said to be the largest art fair worldwide. In this context, it almost makes more sense to talk about trends, as the individual artists worthy of further study were as numerous as stars in the sky. It was a huge privilege to be able to see the world’s most exclusive galleries and cutting-edge artists all in one place, and I would recommend if you have the chance to go to Basel, you should do it. I saw a dozen or more pieces that showed the influence of Tony Ousler, Anne Wilson, and even Jeff Koons. I saw some of the Modern works you’d expect; Picasso was everywhere. 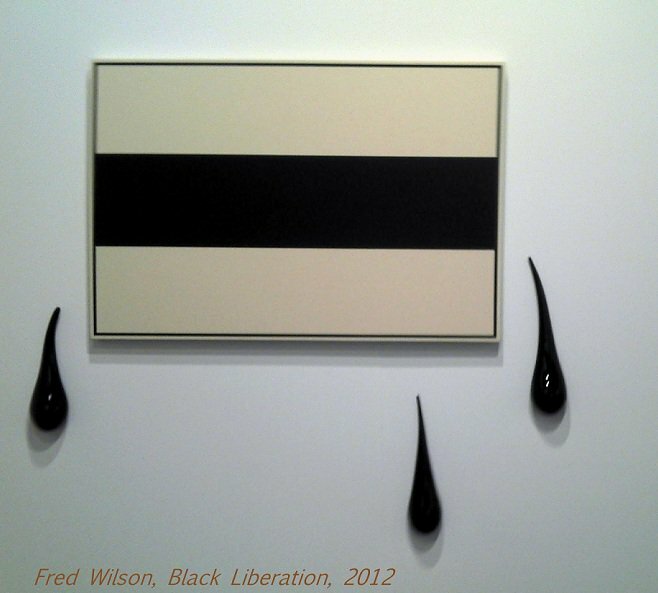 Fred Wilson’s Black Liberation seemed as much a comment on the fair as a larger social critique. (For more works by Black artists participating in Art Basel, visit The Hollywood Sentinel at the link below). 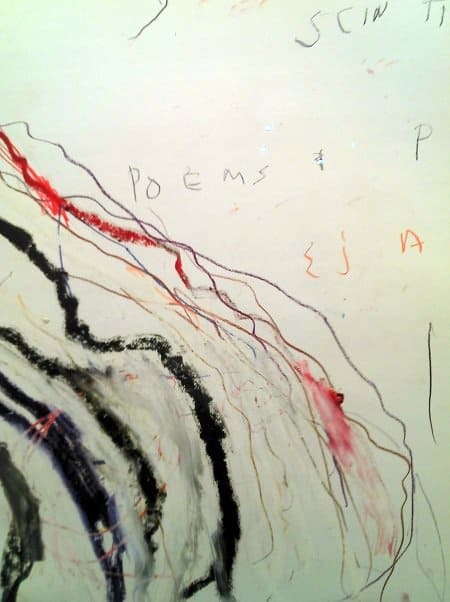 I remember several galleries with works by one of my favorite painters, Cy Twombly, but Silex Scintillans brought tears to my eyes, perhaps because of its shared palette with Twombly’s Wilder Shores of Love, a nostalgic reference for me. I always felt camaraderie with Tracy Emin. I couldn’t resist a photo opportunity in front of her neon installation, “You Loved Me Like a Distant Star,” on view at Lehmann Maupin. 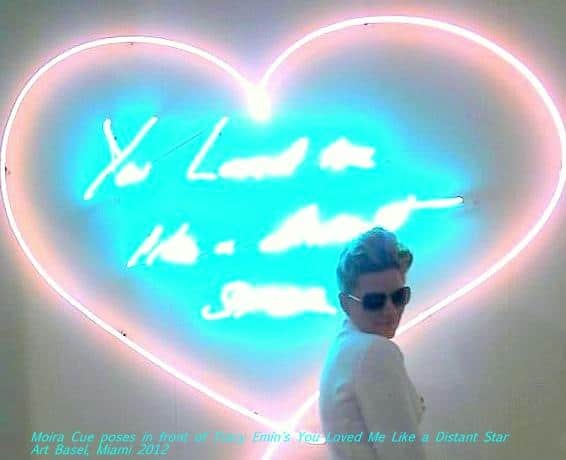 you loved me like a distant star Moira Cue Tracy Emin. 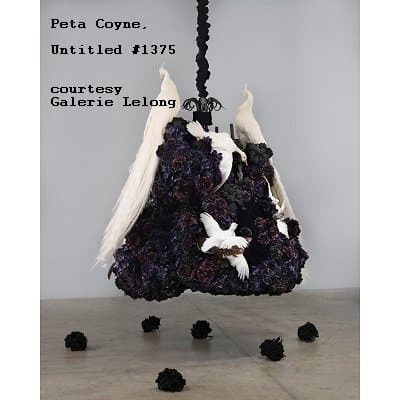 Marc Swanson’s crystal-studded reindeer horns and Peta Coyne’s giant piles of free-floating taxidermy birds stretched the term “medium” to include substances you wouldn’t find at any art store. Other unusual materials included Styrofoam, food, plants, cement, elephant dung, and Mylar (yes, the cheap stuff that birthday balloons are made of). 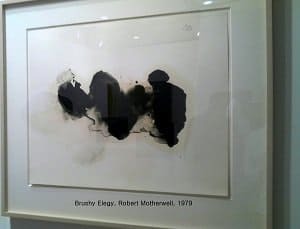 If I were choosing a personal Art Basel “favorite,” I would pick Robert Motherwell: Brushy Elegy, 1979. The elegiac basics of a restricted palette and the mark, merged in poemy purity, rise in my memory, like proverbial cream. Prices reflect SELECT Fair discount and may not be honored, at artist’s discretion, to future patrons.